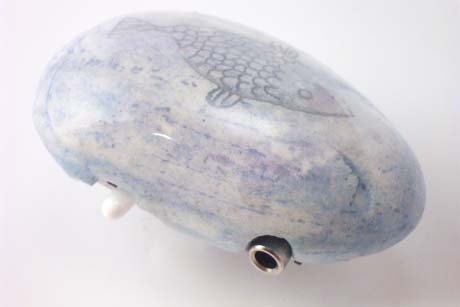 Unique cast stone and resin decorative piece and working FM Audio Transmitter in the shape of a rock. Featuring a carved and painted design on the case. Good signal strength with stereo like quality sound. Operates on a single 3.0 Volt coin cell battery. Broadcast any audio stream to any FM radio within 30+ ft. Each case is signed by the artist(hand carved signature). Includes 6 ft. stereo audio cable. *Single 3.0 Volt coin cell battery not included.